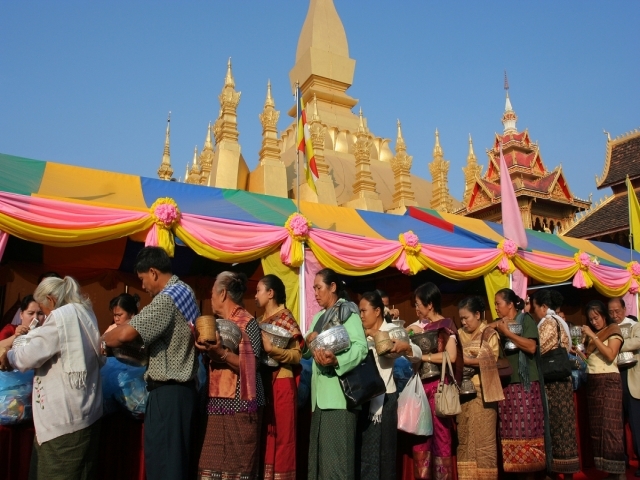 Laos grew its culture as the inland crossroads of trade and migration in Southeast Asia over millennia. As of 2012 Laos has a population of roughly 6.4 million spread over 236,800 km2, yielding one of the lowest population densities in Asia. Yet the country of Laos has an official count of over forty-seven ethnicities divided into 149 sub-groups and 80 different languages. In Southeast Asia, traditional Laos culture is considered one of the Indic cultures along with Burma, Thailand and Cambodia. Laos is approximately 60% Theravada Buddhist, which roughly falls along ethnic lines with the majority of practitioners being Lao Loum. The remainder is largely animist, following their unique ethnic traditions and practices. Even among the Lao Loum there is a high degree of syncretism with most Lao acknowledging the traditional animist traditions known collectively as satsana phi. Other religions are in the minority including Islam and Christianity and represent a combined total of less than 2% of the population. Most families in Laos are involved in farming. Members of households work the land together, with a division of labour by gender. In wet rice cultivation, men plow and prepare the seedbed, control water flow to the fields, and thresh the crop. Women transplant the seedlings, weed the fields, and carry the sheaves of rice to the threshing place. 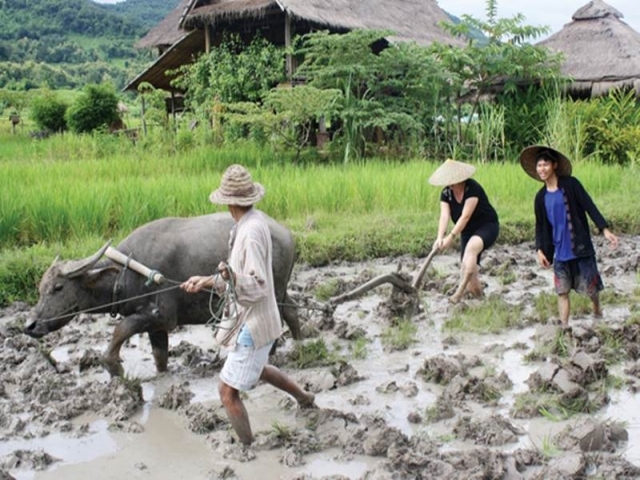 In upland rice cultivation, men cut and clear the swiddens, while women do the sowing and weeding. Wet rice cultivation begins with the onset of the rains in April or May and ends with the harvest in October and November. In upland areas, fields are burned and cleared at the end of the dry season in February and March, and harvesting takes place in November. Cultivation of secondary crops is interspersed with rice cultivation; gardening on river banks, for example, follows the drop in water level at the end of the dry season. 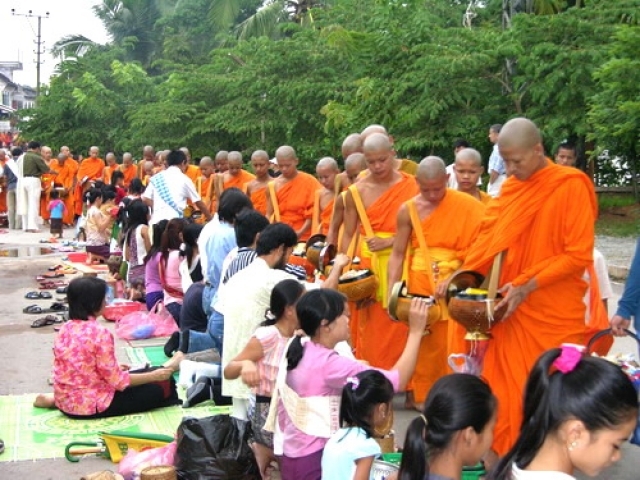 Laos cerebrates many annual festivals called "Boun" in Lao Language which are particularly enjoyable and beautiful, signifying traditional aspects of Lao lifestyle. Most festivals are connected with religion and the yearly rice farming cycle. 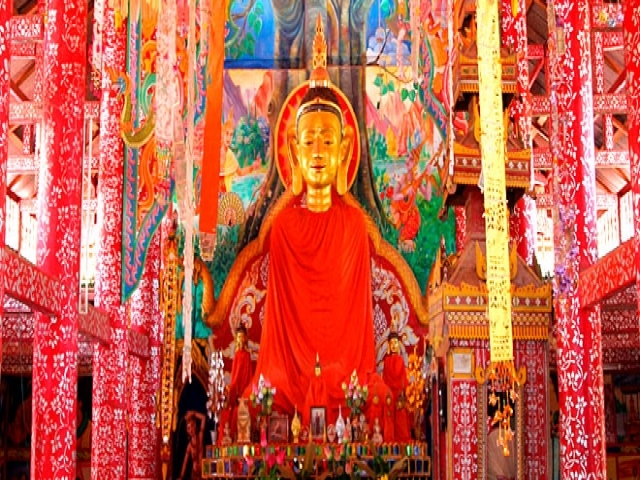 The timing of the festivals is calculates according to the Buddhist lunar calendar, thus changed every year. Laos has experienced several major wars and occupations since the eighteenth century. Laos holds distinction as the most heavily bombed country in world, as a result of the wars against the communist revolutions in Laos, Vietnam and Cambodia during the 1960s and 1970s. Years of economic isolation have also taken a toll. The international trade in antiquities has also taken a toll on Laos’ artistic heritage due to persistent poverty. As a consequence much of the traditional art and architecture in Laos has been pillaged, sold, destroyed or suffered significant damage over the past three centuries. Lao metalwork in gold and silver is experiencing a resurgence from its high point in seventeenth century Lan Xang. Silver work is especially prized and popular among ethnic minorities including the Hmong and Yao, and can be found as popular elements of traditional dress among married women. Laos produces a number of handicrafts which use bamboo and other forms of basketry. Traditionally Lao use intricately woven bamboo mats in homes and temples, although much of the art form has been lost due to the availability and durability of plastic substitutes. Basketry is quite common and is traditionally seen in various forms of domestic kitchen equipment, or even in the house where bamboo thatching is still commonly used. Traditional clothing serves as the key visual cue for establishing belonging among ethnic groups. The techniques, patterns and materials vary not only by region and ethnicity, but even by clan and family. 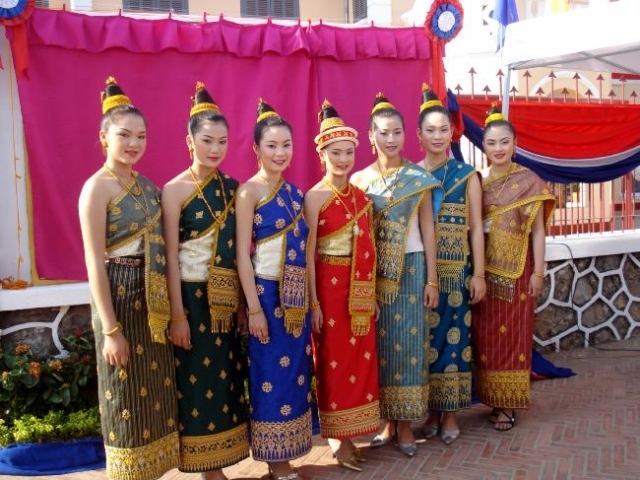 For the Lao Loum, traditional dress reflects Cambodian, Thai, French and Burmese influence. Among men, the Lao traditionally wear a Khmer style billowed trouser or sampot, a Mandarin collar jacket or Indochinese shirt, and a simple pha biang or checkered shawl which is similar to the Khmer krama. Among older generations and areas of the north it is also not uncommon to see men wearing a checkered or plaid pha-sarong which is similar to the Burmese lungi. For women, the traditional dress is a long skirt with a richly embroidered foot called a sinh, a matching pha biang or shawl (longer shawls called hom are worn in colder areas), and is worn with a French inspired blouse. Men and women wear religious amulets, and large amounts of gold and silver jewelry which is believed to ward off evil and is a conspicuous sign of wealth. Colors patterns and embroidery techniques distinguish both region and class. 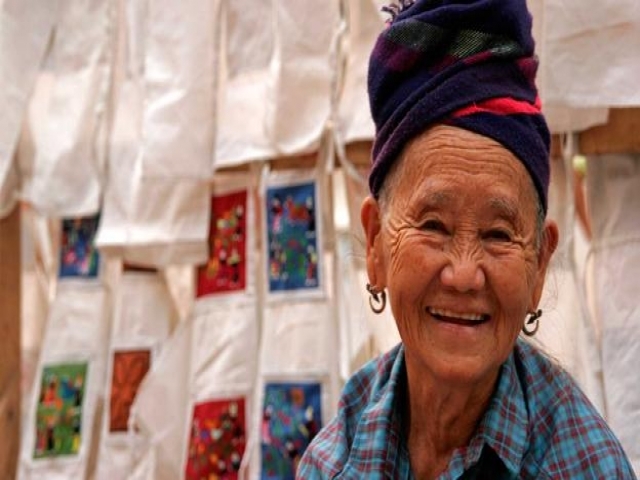 Lao Loum use silk almost exclusively in many of their traditional designs. 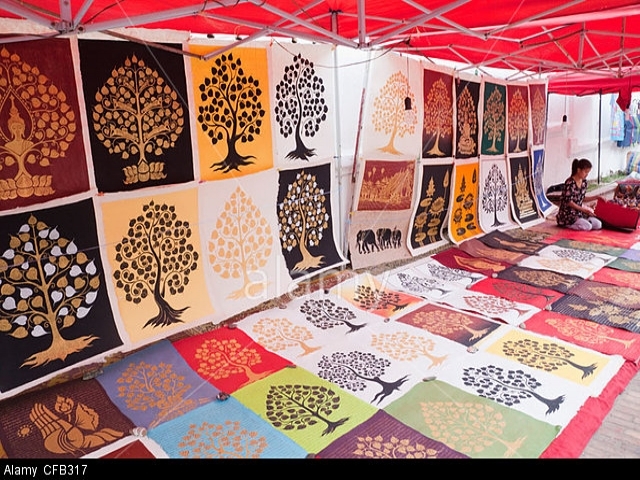 Among Lao Theung, cotton materials are widely used. Khmu women are known for simple cotton sarongs with horizontal stripes, and long sleeved black blouses. Among Katu and Alak there is a tradition of adding significant amounts of beadwork and silver coins. Lao Theung use silver and brass jewelry in large amounts both to ward off evil and signify status. 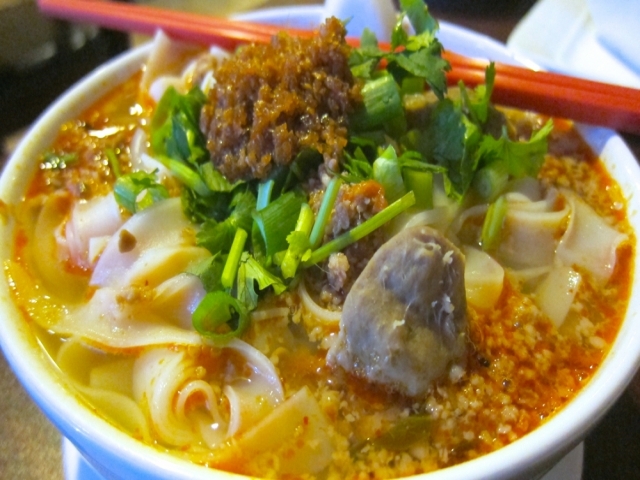 Lao cuisine reflects the ethnic diversity of the country and its surrounding neighbors. Laos has strong regional variations even among common dishes, with glutinous rice (sticky rice) being the staple of most meals. 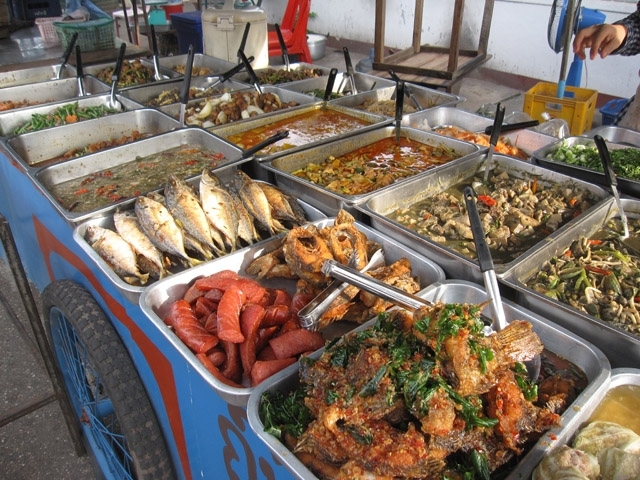 A common Lao meal would consist of a richly spiced minced fish or chicken salad or larb, served with sticky rice; a jaew or paste made of chili peppers for dipping; tam mak hung a fiery and sour fresh green papaya salad, a both based soup like kaeng no mai (bamboo soup); fresh herbs and vegetables served raw; tropical fruit as a dessert; and is served with the local beer or lao-lao rice liquor. 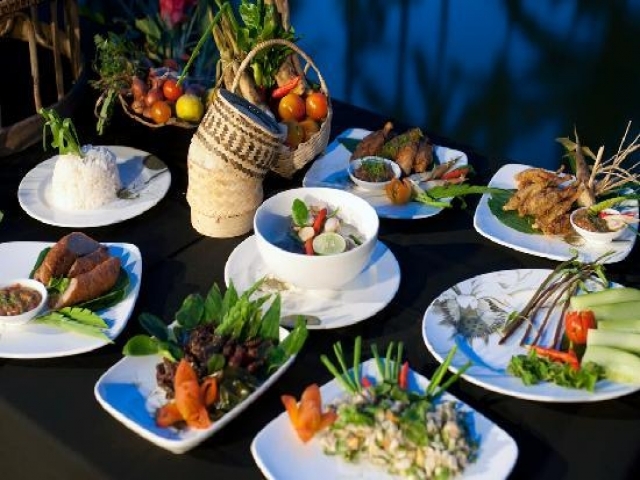 Lao cuisine is similar to Thai, but with several notable differences. The Lao meal as a whole generally appeals to more extremes of sourness, bitterness, and spice than in Thai cuisine. Lao cooking uses copious amounts of mak phaet (chilies), pa daek or fermented fresh water fish sauce, kaffir lime leaves, and galangal in greater amounts to add bolder flavors to most dishes. Glutinous rice is eaten almost exclusively in ethnically Lao areas.